Task automation (within existing applications), management reports, etc. Where to process what quantity? This MS Excel VBA application has been developed for a waste company that collects waste in a hundred locations and processes it in several hundreds of locations. Each location has fixed and variable operating costs, minimum and maximum processing capacities and technical restrictions. If required, several types of waste can be mixed to make the flow processable on a certain location. How should the waste flow, in order to minimise costs, while adhering to all constraints? To answer this question, this MS Excel VBA application interfaces with mathematical software (AIMMS which uses the CPLEX solver) and a route planner (TLN Planner). Also the cost effect of having less or more capacity is determined. This information is useful in negotiations about prices to be paid for hiring capacity. Text below - about this project done by Alrik Stelling of Stelling Consulting (then Deloitte consultant) and Harry Westerbeek (project manager Strategy & Development of SITA Nederland) - was published as a reference case on the website of AIMMS. That website currently shows recent cases only. Also, an article about this project has been published in the well-known Dutch magazine ITLogistiek. 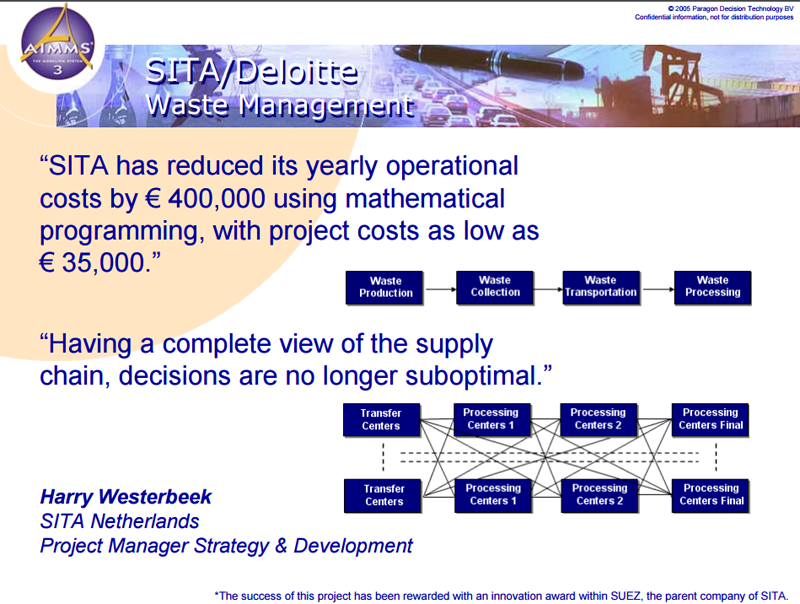 SITA Nederland is a market leader in waste management in the Netherlands, with a turnover € 443 million in 2003. It serves 80,000 companies, and 100 municipalities with a total of 1.8 million inhabitants. SITA Nederland has lowered its transportation and processing costs using a strategic and tactical mathematical optimization tool (MMX II) developed in cooperation with Deloitte using the AIMMS software. Waste volumes in the Netherlands are split as follows: household 15%, business/government 9%, industry/agriculture 36%, construction/demolition 34%, others 6%. Waste processing volumes are divided as follows: incineration 11%, landfill 14%, recycling 75%. Supply and demand play a part, and are regulated by the waste trade. Such a trade exists because some waste companies focus on collection, while others focus on processing. The average profit margin in the industry was as low as 4% in 1999. Profit margins can change rapidly due to the tax system, legislation, support for recycling, and new process technology: for example, between 1996 and 1999, the margin on 'incineration' dropped from 21% to 1%. Transportation and processing costs account for more than 50% of total costs. Minimizing these costs is thus important in increasing the low profit margins. SITA's planning question is which centers to use, and how waste should flow among them, to minimize transportation and processing costs. Waste is collected and temporarily stored at Transfer Centers; the collection itself is not included in the model. Several types of waste are collected with various characteristics, such as chloride percentage. Waste is generally processed in three steps, each representing a different type of process. Step 1 is carried out in one of the Processing Centers 1, step 2 in a Processing Center 2, and step 3 in one of the Final Processing Centers. Sometimes not all the steps are necessary, and some centers can carry out more than one step. In total, there are more than a hundred possible ways of processing waste arriving at a Transfer Center. In terms of modeling, each center has its own location, start up costs, and operational costs. Naturally, each center has a fixed processing capacity, but also other technical constraints such as only being capable of processing a waste flow with a chloride percentage within a certain band. In order to match these constraints, several types of waste can be mixed but there are no fixed recipes of waste flows. Transportation costs depend on waste characteristics, transport distance and time, and truck costs per mile and per hour. All the Transfer Centers are fully-owned by SITA, but SITA does hire additional processing capacity from others. Contractual obligations - non-technical constraints - limit the options in deciding whether or not to outsource a waste processing step. SITA's planning need is to optimize the usage of the various Centers and the flows of waste such that the transportation and processing costs are minimized while taking into account the situation described above (technical and non-technical constraints). Validation of a-priori assignments etc. The network (600 nodes connected by 30,000 arcs) is then built up automatically (in VBA) in the appropriate format, and then delivered to the standard AIMMS-Excel interface. Using the mathematical solvers underpinning AIMMS, the following are calculated: waste flows (what amount of what waste from where to where) through the network, shadow prices, transportation costs, and processing costs. The costs are then minimized. On costs, waste flows, activated centers, etc. Apart from the tactical planning - resulting in a plan minimizing monthly costs - the tool is also used for strategic planning by running different scenarios. The derived shadow prices are useful in the negotiations over long-term prices to be charged by other waste processing companies for hiring their processing capacity. SITA has reduced its yearly operational costs by € 400,000 using MMX II, with project costs as low as € 35,000. The whole project has been the equivalent of two months of work, spread over five months. Having a complete view of the supply chain, decisions are no longer suboptimal. Nowadays, waste is transported from one plant to another if the decrease in total processing costs exceeds the increase in transportation costs. Previously, waste would rarely cross SITA's regional borders since regional managers did not have an overall view of the full chain. The cost reductions mainly stem from better utilizing the processing locations. Further, even the total transportation costs have been reduced. The success of MMX II has been rewarded with an innovation award within SUEZ, the parent company of SITA. In September 2004, an article was published in the well-known Dutch magazine ITlogistiek focusing on SITA's user perspective. The author, Alrik Stelling - a Deloitte consultant specializing in supply chain management - has been responsible for the tool design, tool programming, and formulating the mathematical model in AIMMS. Harry Westerbeek - project manager Strategy & Development of SITA Nederland - was mainly responsible for describing the requested functionality of MMX II, describing SITA's supply chain, and testing/validating the model. When to produce what quantity? This MS Excel VBA application shows the impact on inventories and product availability of different planning methods. Inputs are minimum batch size per product, production speeds per product, total production hours available, setup times between products, product demands and forecasts. The user chooses planning options/settings, thus creating scenarios. 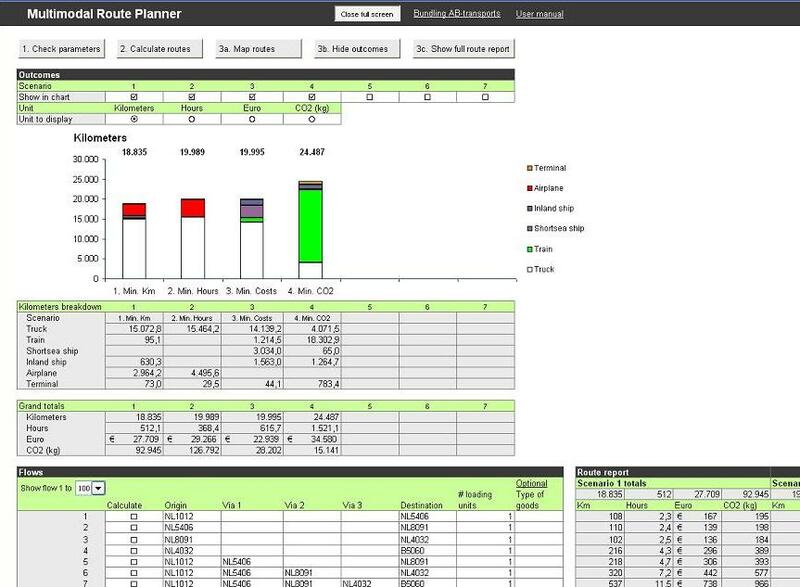 Outputs are daily production schedules and inventory levels - per scenario - which can be compared to each other. This proviodes insight into which planning options give the best results (low inventory costs and high service level). 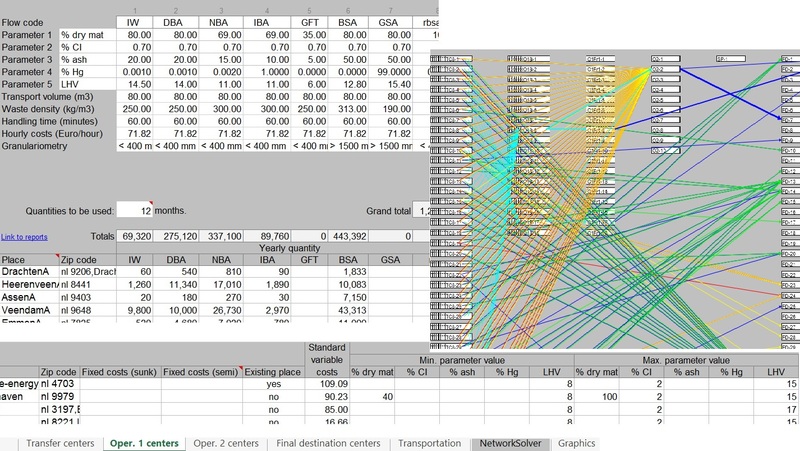 This MS Excel VBA application routes transport flows through a huge European network of roads, waterways, rail roads, air lanes and terminals, while minimizing costs, kilometres, time, CO2 emissions, or a combination. One can define scenarios (e.g. "what happens with costs and CO2 emissions if we forbid a certain modality") and compare scenario results. This provides insight into the possibilities of a modal shift towards more sustainable transport. The application interfaces with Google Earth for geographical visualization. Underlying database is bought from a third party (and reworked). A.o. specialized in supply chain network design, and developing advanced (logistics) MS Excel VBA models. E-mail addresses differ from each other!